You and your students will prepare for a classroom Thanksgiving celebration in today's lesson. If possible, invite parents to enjoy the day and help to manage the celebration. All of the work on Thursday will be in preparation for tomorrow's celebration. There will be no math skills or language skills in this lesson for that reason. You will not need materials to prepare for the lesson today. If parents will be invited, the classroom should be decorated with the seasonal projects created by the children. Provide children with a piece of construction paper and a crayon or pencil. Instruct the children to listen to the following story carefully and follow directions. This is the story of "Turkey Lake"
1. Long ago, there was a beautiful lake on the prairie. 2. Fish swam in the lake. 3. Duck and geese came to the lake. 4. Sometimes the Indian people set up their teepees and camped near the lake. 5. They walked to the lake to get fresh water. 6. One day a family of pilgrims built a house near the lake and built a fence around it. 7. They too walked to the lake to get water and to catch fish. 8. One day, they looked out the little round window in the wall of their house. 9. "Oh no!" they shouted. "The ducks and geese are flying south for the winter! Now what will we eat? 10. Then they saw a bird tastier than a duck or geese! The completed picture should be that of a turkey. If it is not possible to invite families to the celebration, then get together with another class and have a Thanksgiving celebration. Today's lesson will consist of a Thanksgiving celebration for either the class, invited parents, or another class in the school. Whoever celebrates with your class, it is sure to be a success. The activities listed here will add a fun and festive element to the class, and your guests are sure to enjoy it. Materials Needed: Bingo cards and mini turkey cut outs for space covers. Play a few rounds of bingo with your students and their party guests. When a person wins bingo, they should holler "Gobble! Gobble!" Encourage children to tell the story of the first Thanksgiving in their own words. If guests are in the room, some children may be uncomfortable with public speaking. Encourage a child, but never force them to speak in public. Play Turkey, Turkey, Goose! Children should sit in a circle and play the game of Duck, Duck, Goose…with a Thanksgiving twist! 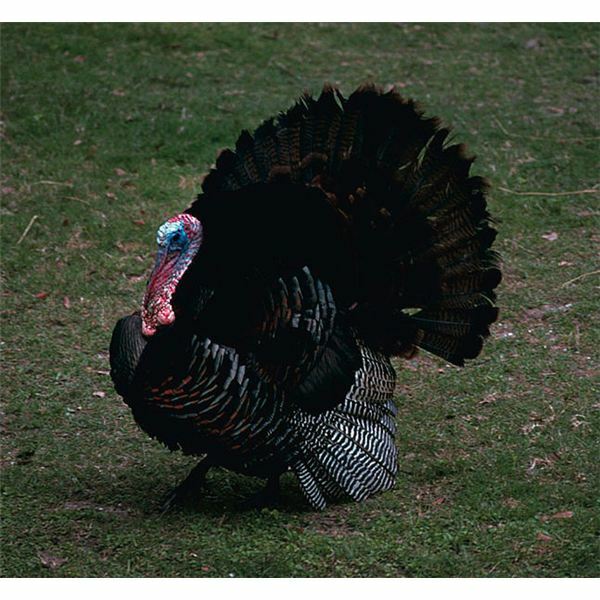 Pin The Feather On The Turkey: Adhere a pre-printed poster of a turkey to a convenient location on the wall. Provide a construction paper feather for the game. Blind fold each child and guest so that they may have a turn putting the feather in the right location on the turkey. The man had to keep hunting on that Thanksgiving Day! Many years ago, the Pilgrims found our land. We thank them for discovering this country so grand. For this land where we are free! It's been a week-long journey that I hope culminated in a fun celebration of festivities and activities with your students and invited guests. Let us know how you celebrate Thanksgiving with your classroom! This is a series of harvest lesson plans designed for the kindergarten classroom. In this portion of the series, the children will learn about turkeys. The lesson is presented by activites, math and language skills, as well as art projects.